Getting the most out of low-cost ammo. Using a hand made die cut pattern, pellets inside the vital area were counted as kill hits. Advanced wad-stop chokes returned the best results, which were later proven in the field. It can be a marriage made in heaven in terms of the perfect match between budget level shotshell ammunition and high-performance waterfowl chokes. With the increasing cost of non-toxic shotshells today, more hunters are paying attention to how best they can cut cost while still maintaining some level of quality performance. During the fall of 2007, I spent a major part of that waterfowl season testing various brands of budget steel shot loads while locking down a rather high-priced choke tube on the muzzle of my 12 bore. I was more than pleased with the field results. What was different from shooting low-cost steel with standard choke tubes was that at all times I was striving for ultra tight patterns that would put more shot on target, regardless of shotshell brand or component type. The trade off was that I did miss more birds during those days that I was just not completely on target. When I did get hot in terms of hits per rounds fired, everything locked into perfection. When bringing this ballistic event together, I first selected special hunts that made good use of decoys, allowed a solid understanding of a very well measured range to the target, and was undertaken at a time when birds were plentiful in my local area. Ranging equipment consisted of a high-end laser range finder, and as a test gun I elected to shoot my Remington 870 Express Magnum because this gun retained better than five advanced choke tubes that fit its thread pattern. Even with that number of test tubes I was still able to add another totally unique tube of my own design, that like the test itself, was under evaluation for just such advanced performance work as applied to the low-budget field ammo. The first live shooting test took place on a small spring fed mallard hole near my end of the Black Hills that always produced evening ducks. In general, my partners and I would have about 20 minutes to get in some fast shooting as mallards and early season wood ducks dumped into the cattail slough for the night. After setting up a few mallard blocks, our crew of four hunters made use of some local Russian olive and cattail while covering up with paint and facemasks. Now with the sun at out backs and the easy breeze in our face, we were set for the first incoming flocks of the evening flight. In a matter of minutes and with my watch indicating that we had less than one-half-hour to get our birds, the first three wood ducks buzzed the decoys from right to left. At a high rate of speed, the four guns cut loose with three of them being equipped with PatternMaster "wad-stop" chokes, and my gun equipped with my own prototype "Dead Ringer", so named because of its experimental inner ring wad stop construction. Shooting very basic loads of #3 Remington 23â„4-inch 11â„4-ounce steel, and also a mixed batch of Wolf 11â„4-ounce 3-inch #2 steel, the two drakes bounced off the water as the hen peeled out and away from the firestorm. There was barely time enough to reload as mallards rolled in and across the decoys a bit high and moving far too fast for a shot. With calls now working to pull the ducks back, we set up the trap once again for additional shooting. Within seconds the mallards locked their wings and set their sights for the middle of the spread. Again, our guns belched #2 and #3 steel, as the two drakes rolled through the decoys spread. This event was to repeat itself several times over the next few minutes, and we stopped shooting only to make an accurate count of ducks so as not to exceed our limits. 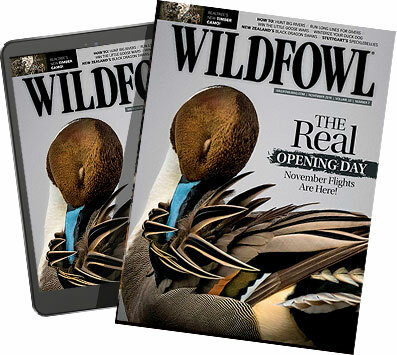 If this preview sounds almost too good to be true, all I can say is that after several years of hunting with my pals on western South Dakota duck sloughs, almost all of them now shoot payload control system that are known to produce ultra-tight, well-controlled patterns at close range, and deadly patterns out at the point many loads begin to fail with more open patterning choke tube systems (50 yards down range). While I am not about to tell you that I am a physicist of any kind, I will say that I have learned the value of pellet density (or a lack thereof) in terms of inflicting enough damage on a duck or goose so as to bring it to bag. With steel shot, the big factor is always pellet contact numbers against the target. Lacking enough hits which compounds the net effect of raw energy, the bird continues to fly, becoming fox food down the line. If steel has a major drawback, and it sure can at times, it is this massive lack of density. We have learned to move up in shot size, or increase muzzle velocity which all help regarding saved or maintained energy on target. However, payload pellet count on target is, and always will be a major determining factor regarding positive performance of a given load. Even if the payload is lightweight shot, get enough of it on target and the energy compounds itself greatly. What the pattern testing indicates is that the advanced chokes system as in PatternMaster Wad Wizard, or even my prototype Dead Ringer system TM, will produce better patterns with more shot on target than say your standard long parallel section, or short taper smooth bore choke tube. In this case, spend your money on better chokes for high performance work and save on buying the $3.35 per shotshell ammunition to get some added energy down range. What can be easily seen by the results of my somewhat abbreviated vital area pattern test is that advanced choke system do indeed seem to increase pellet strikes against waterfowl targets. While the results using very small steel shot are not that impressive, the larger steel ball builds energy quickly, and you can bet that it will knock a duck out of the sky in short order. My partners and I found that Hevi-Steel by way of PatternMaster and like choke systems was just flat out deadly. Even the budget loads by Wolf ammunition returned some very effective steel shot performance. It didn't take long before my partners that were shooting performance chokes were asking for a handful of " those Wolf black loads" to be passed down the blind. At first these same hunters, as they shot the fancy high priced loads, laughed at those budget loads, but in time, and after seeing the budget load perform with advanced chokes, that almost mocking smile left their faces permanently. Load:12-gauge 1 3/8 oz 3.5" "B" Hevi-Steel EnvironMetal Inc.
*100 rounds per individual load and choke would need to be test fired and averaged in order to develop a definitive colclusion. ***In general it requires 2 ft/lbs of energy to gain proper penetration on a warm target (duck)Lacking that figure penetration can be less then adequate.